Testy Copy Editors • View topic - What's a crash blossom? Post subject: What's a crash blossom? Post subject: Re: What's a crash blossom? linked? the hed makes it look like she was a survivor of the crash, but not that case. what do you call these kinds of strangely phrased hedlines? is there a word for them? Post subject: Re: What's a crash blosssom? I think you answered your own question, Dan. "Crash blossom" would be an excellent neologism for infelicitously worded headlines. Credit for this neologism must go to Nessie3. Hear! Hear! I love it. That's exhausting to read........ you have an eye for these crash blossoms! More like Japan Today and the Kyodo News wire service have a rare talent for them. and they are apparently blossoming all over. Somebody should put them in a book or a blog devoted to them...... hey, that's a good idea! Nessie3, with your permission, and giving full credit to you for coming up with this great "catch" and the coinage too, I will create a blog right now called "Crash Blossoms" and start cataloguing these things above and more as they come in. My crash blossom secretary will handle the details. This sort of enthusiasm for new argot makes me queasy. On the other hand, John McIntyre's incomplete glossary of endangered journalism jargon is an entertaining read. Only about 30 to 40 tigers survive in the wild in China. But about 5,000 live in tiger farms, where they are bred at great speed. Post subject: Shh. People are listening. Saw one a few days ago on the BBC site that said Army makes safe 600lb bomb. I'd have posted then but the TCE site was down, and by the time it was back up they'd changed the hed. This reminded me of my favorite redundancy flag: What's the difference between a "dangerous weapon" and the other kind? Post subject: Re: Shh. People are listening. It doesn't exactly make things any clearer! I think a local reader more familiar with the acrononym JAL might have a better chance of semi-understanding the headline, but it just goes to show you should almost never use acronyms in headlines unless they are so common as to be beyond misunderstanding. Welcome indeed - I'm surprised there is any demand for editing Irish in China. Or should that be erse? I CAN tend to be terribly literal at times, and it IS part of my sense of humour, Bear with this testy lot and you will get to enjoy us. Able was I erse I saw Albion. It would be "Irish" or "Irish Gaelic." As its spelling makes poets too waoghaire. Hilarious! Although a fastidious editor back home would definitely add an accent called a fadha to Dún Laoghaire. As to the language, it's generally known simply as 'Irish' within Ireland, or 'Gaeilge' which means Gaelic in the language itself. P.S. My partner - a New Mexico native who high schooled in Lubbock - asks if your name means you edit'er! I'll edit'er if she's game. Might be fun. The entire story is incomprehensible. AT&T Inc. says Google Voice curbs costs by refusing to connect calls to places where some local carriers give phone numbers to adult chat lines and conference-calling services to draw long distance calls. The company asks the FCC to stop rural carriers from boosting incoming calls and charging high fees, or to hold Google to the same rules. Rice — a staple of unstable future, funds? Last edited by Editer on Fri Oct 23, 2009 6:06 pm, edited 1 time in total. Y'all do know that most of these are intentional and thought to be clever by the writers? That's what makes them egregious. I think that's more two-faced than crash blossomish, but it is pretty damned funny. It must've taken me upward of two minutes to figure it out. But I'm kind of tired. Online now, "Tide defensive lineman’s blocks salvage game." Obviously a story about a development by a tekkie company in Tiny Township (yes really) in northern Ontario. After that, I'm baffled. Now I know why party poopers have the bad rep. Yes, this one is regionally specific. But still..
You must sit under the sun, drink good wine and eat delicious food for the rest of your life, hahahaha! Capital is voracious and amoral. OK. This about wraps it up. Sorry, but this has to be said before we wrap up: What an awful illustration. I especially like the "Standard says." Bridge Over the Visa Moat for Musicians Trying to Enter the U.S. The latest is a little klumsy, but understandable. Next time, perhaps someone will think about it before posting a headline. Wait. Never mind. But ... but ... the latest hed lacks wordplay. Are Americans' worries over the direction of prices inflated? That's a crappy headline, but I'm not sure it's a crash blossom. Didn't you have visions of bizarre carpentry? Or is it just me (and my equally twisted friend who pointed it out to me)? I did but I'm not sure that makes it a crash blossom. We may have to work on a definition. Since the term was not my invention, I am unqualified. Phillip, it seems to me that one essential element of a crash blossom is a word that can serve as either a noun or a verb. In other words, it seems to me that the original and the majority of the follow-ups cited have a word that can serve as either a second verb or the object of the first. So we have a pattern of subject-verb-ambiguous word pattern that can be interpreted as either subject-verb-object or subject-(verb phrase modifying the subject)-verb. Someone who recalls more grammar than I might come up with better terminology. And a second essential element seems to be that, without the full story, it's next to impossible to figure out what in the heck is going on. The thing that gets me is that the Internet was supposed to free headline writers from the constraint of tight counts. Yet we still get the inscrutable shorthand that leads to these headscratchers. Yes, but there's still room to add "a" or even "is a hit" to this one to add a bit of coherence. Thank you, Search Engine Optimization, which depends on keywords, not clarity. Presumably, enough humanoid robot fans will find the story and click on the link to make clarity and line-filling less than an afterthought. I can't disagree but, in fairness, I saw plenty of headlines just as bad before there was a Web. 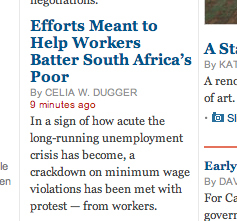 "Efforts Meant to Help Workers Batter South Africa’s Poor"
Don't know about the rest of you but I love it when workers are getting help at battering the poor. The print headline had the same flaw, although for some reason "squeeze" doesn't seem to have the crash-blossom power of "batter." agreed, but "squeeze" is considerably funnier. Just caught up with the FDA/salmon CB. That might be my favorite one yet. Awful on every level! We need some sort of crash blossom item in the Testy Copy Editors merchandise store. Just in time for Xmas, of course. I think such a product would require design skill beyond my meager abilities. Volunteers, step up! Fortunately, copyright laws prohibit any logo involved from stealing part of the baffling (and, IMHO, awful) illustration that ran with the NYT crash blossom piece. "TCE: Tracking the wily crash blossom since 2009"
Here's one for the file. More a headache inducer than a crash blossom -- unless you glance at it while walking past the coin box. Made me back up and look again. I note that many, if not most, of the headlines at http://www.crashblossoms.com/ are not crash blossoms at all. First thought, "only the Brits..." but turns out to be only on The Google. Paper did a bit better. [*] Yes, the writer meant "overhead," as in "kid put in airline bin." I didn't even know he was sick. Bonus: Misspelled "Murdoch" in one of the smaller heds. We're once again slipping into the territory of misapprehending what exactly a Crash Blossom is. It's not just a bad or unwieldy headline. I'm having fun imagining that the elided word comes after "better" instead of before, and what it might be. Immigrant Advocates Blast Brown Vetoes in Calif.
How much? Inquiring minds etc etc. Any number of Google hits. Then pick him up and give him some bird food. Had they taught him Arabic, he could have said, "Don't shoot!" No way to treat a hero.